Northern Lights taken from the Schnaus Cabin north of Polebridge Montana April 19, 2018 looking into Glacier National Park. These unique Auroras were described by Spaceweather.com. They were caused by An interplanetary shock wave hit Earth's magnetic field on April 19th around 23:50 UT. When the disturbance arrived, the density of solar wind flowing around our planet abruptly quadrupled and a crack opened in Earth's magnetic field. The resulting G2-class geomagnetic storm sparked unusual "electric blue" auroras. "Electric blue auroras!" he says. "This was while on a red eye flight from Edmonton to Toronto around 4 am over northern Manitoba. Unbelievable sky." 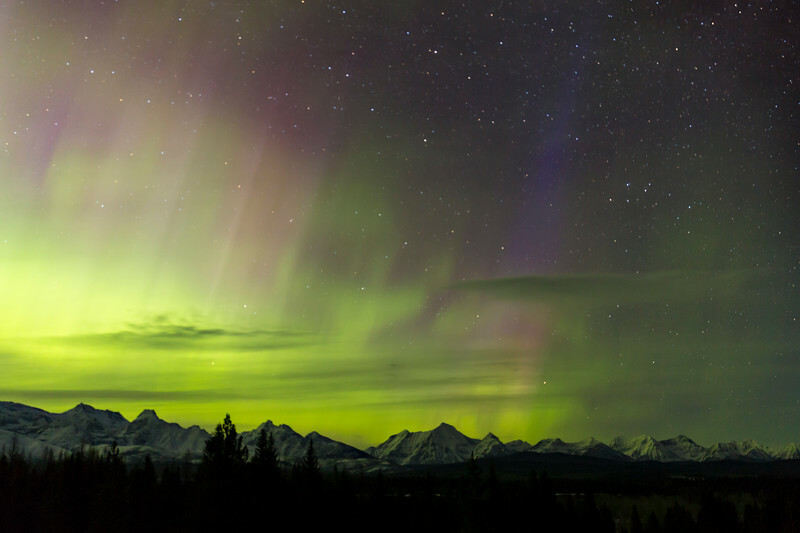 Auroras are usually green--a sign of oxygen. Rare blue auroras are caused by nitrogen molecules. Energetic particles striking N2+ at the upper limits of Earth's atmosphere can produce an azure glow during intense geomagnetic storms.